This hotel opened in 1925, and a lot of mysterious happenings occur here. 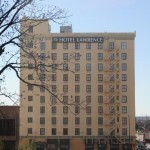 On the 10th floor, witnesses have reported the sound of crying and footsteps in high heels, along with cold spots and strange shadows — it is said that a woman in the 1940s jumped or fell to her death from the presidential suite, and a congressman may have committed suicide here as well. This is said to happen between midnight and 6 a.m. 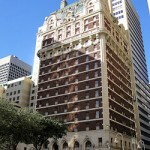 The ghost of a gambling man is said to haunt the second floor, where there was an illegal casino in the 1920s-1930s. In the basement, staff members have said that laundry carts move by themselves. My FFA chapter stayed at this hotel last summer for the State FFA Convention. We stayed on the 9th floor, I woke up the second night we were there at 3am because I felt a body sit on the bed next to me and I heard a women’s voice, humming. But when I woke up and looked around, nobody was there. July the 20th 2014 I woke up for check out time.I walked the 10th floor hall where i was staying with my movie camera.I stood in front of room 1009 and said ‘ C’mon Smiley let me know if you are here.”Nothing was perceived .I walked down the hall filming until I got back to my room by the elevator.Watching the video later,when I addressed Smiley it went instantly to black with the audio still on.A robotic voice clearly said “This is me Smiley “.The picture came back very staticky and back to clear.The static returned then was back to clear again.The voice was disturbing. Damn this is hella scary.